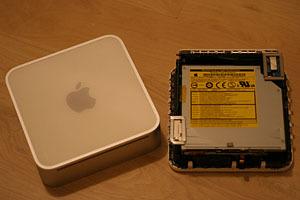 A few days ago, my ancient mac mini (PowerPC G4) hung during OS upgrade. Can't boot up anymore. Using the original OS X installation disc can't recover the system. The recovery also hang in the middle of installation. Last resort: crack open the machine and tried to replace the RAM. Actually it is sort of upgrade (from 512M to 1G). Mystically, the re-installation finally worked!